The Crown Designs is proud to serve businesses in New Jersey with top-notch product design and branding services. Whether you’re a cosmetics manufacturer that’s looking to redesign your products, or launching a new beer at your craft brewery, The Crown Designs is here to help ensure that your products look their absolute best. Contact us today! Spring is here, and with spring comes change and rebirth. 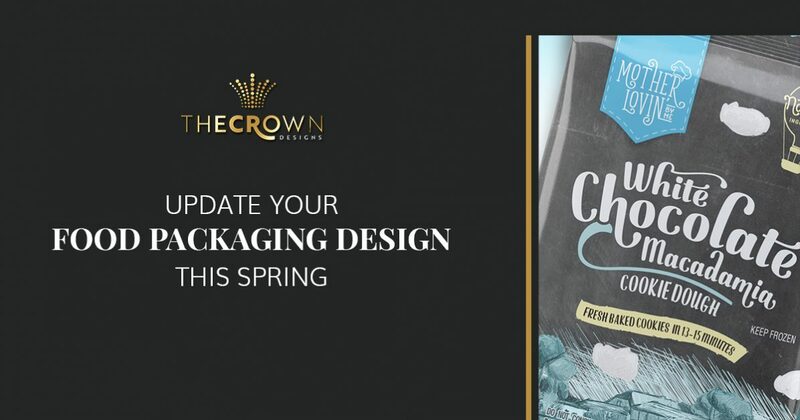 We’ve designed our fair share of packaging for food products here at The Crown Designs, and in this blog post, we’ll look at a few reasons as to why you should consider updating your food packaging design this season. Whether you’ve stuck with the same color scheme since your original product launch, or you haven’t quite found the right one that best fits your product, the colors that you choose to use in our food packaging design can make a bigger difference than you may realize. Aesthetics are key, obviously, and choosing something that is pleasing to customers is key, but something that many brands fail to consider is the affiliation that your customers may have with a particular color scheme. Think about the other products in your industry and then consider the color schemes used in their product packaging design. Coffee products have a tendency to choose browns and similarly tones. Sweeter products like frostings, cupcakes and other dessert items have a tendency to veer toward the brighter side of things, with lots of whites, pastels and fluorescent colors. While these are not only examples of tried and true marketing practices, there’s also another subconscious element to it. Think about it — if you were looking at a bag of high-quality coffee that was packaged in a white and pink color scheme, it may make you think twice about the product’s overall quality. It might also just confuse you, as that color scheme would be a better pairing for a completely different sort of product. Certain color schemes work best for certain types of products, while others may not be as effective. With this in mind, if you feel as though your product’s color scheme may not be as effective as it could be, spend some time thinking about what may work best for it. Survey other members of your staff, friends, or even get a focus group to observe the options for food packaging that you’re considering, changing only the color scheme on each one, leaving the rest of the product packaging design the same. Have them decide what color scheme best fits the type of product that you’re manufacturing. Chances are, you’ll notice a majority of those asked will gravitate toward one or two specific ones, while shying away from others. Minor subtleties like this can make all the difference in your product’s success and should not go unnoticed. Now more than ever, people are paying closer attention to their diets and the ingredients contained in the foods that they choose to consume. From trying to cut down on sugars to cutting out gluten, many people are making dietary changes that are making a great impact on the foods that they choose to purchase. With this in mind, some products are noticing a considerable amount of increased attention because of these sorts of changes. Perhaps your business has always prided itself on providing customers with products that are made from entirely natural ingredients. Maybe your product has never required the need for gluten in its recipe. Maybe you’ve always attempted to offer a low-sugar alternative to some of the other products offered by your competitors. Whatever the case may be, here and now, more people are trying to find products that fit these sorts of criteria. There’s no reason for you to not take advantage of this as an opportunity to update your product’s packaging design. If your products are formulated in a way that would appeal to the current tastes and trends of your customers, there’s no reason for you to not draw attention to these sorts of qualities that your products may possess. You could simply be upfront and clear about the fact that your products are all-natural or gluten-free by adding these to the front of the packaging. You could also have something short and concise on the back that explains about your business’ commitment to providing your customers with products that are made from all-natural ingredients. Whatever the case may be, doing so will not only show your current buyers that you are paying attention to the needs of your customers, it will also increase your brand’s and product’s visibility to a new group of buyers who may not have been previously aware of your products. Whether you’re adding new flavors of an existing product to your product line, or launching a new product altogether, the introduction of something new into your company’s inventory provides a fantastic opportunity to reconsider the packaging design of your existing products. Whether you want to start with something completely new for your new product and have all the other products in your line fit that aesthetic, or try to find a happy medium between something new and something familiar, launching new products is a great opportunity to give your product packaging design a fresh update, even if it’s minor. Those are just a few reasons as to why you should consider updating your food packaging design this season. Whether you’re looking for a new approach to work on your product line or you like some of the past work that we’ve done, The Crown Designs is here to provide your brand or business with the best in product packaging design services and more. To learn more about our New Jersey design agency, get in touch with us today.